All aces are a beginning or renewal. Wands are associated with fire, and fire represents the feeling function. Feeling is a fiery, decisive emotion that determines what is good and what is bad. Feelings are motivational. This card indicates the beginning of an enterprise or love affair. It is related to energy, feeling, passion, and work. 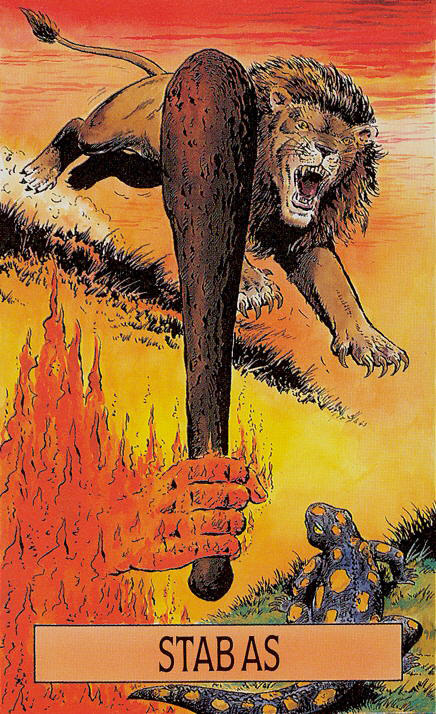 Below you can view the various artistic interpretations of the Ace of Wands card. The Ace of Wands is experienced in the spinal column and crown of the head. This is integration of body, heart, and mind within a spiritual awakening. This is the ultimate celebration of life, the homecoming. It is the moment of perfect atonement. At one ment. The crown opens and showers blessings. The Fool child sits on top of the world. Autumn leaves burn with fire, fruits ripen for the reaping. A bird sings at the top of a column. This is the time of festivals and abundance. The snake coiled at the base of the tree represents sexual / vital energy. Sexual energy is no longer in contradiction with spiritual energy. The magic wand culminates in the union of sexuality/spirituality. The vital energy in the spine flows in both directions. The two are no longer separate; they are one and the same. This is a bittersweet realization. The snake deity of India, representing vital energy, has risen up to the crown. Fire is the element that purifies and burns away the dross. All non-essential material is deleted. Harmony has been achieved between your worldly and your spiritual interests. Your inner voice is not crying in contradiction to your actions in the world. Complete re-conciliation has been achieved. Inside and outside are the same. You can choose to undertake the internal work of the major arcana. Are your inside and outside selves happy with each other? Are you ready to meet your inner self on the tour of the Major Arcana?